Armada does a lot of practice against level 1 foxes. Currently I am doing the same and here’s why I think it’s valuable. 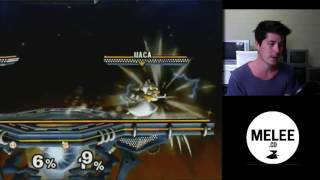 Hey guys, Maca here from melee.co. In this episode, I want to talk about the practice that I’ve been doing lately, as well as why I think it’s valuable to practice against level 1 Foxes. I follow Armada’s stream and he’s obviously the best Peach player in the world. And he will spend hours upon hours beating up a level 1 Fox as Peach. Or, if he’s playing as Fox, he’ll beat up a level 1 Captain Falcon. He’ll just go around talking to chat for 2 hours and also playing against level 1 Fox. He’ll usually start with the same approach. One day, he was doing back air to down smash and would then just follow up with different combos and things like that. The reason that I got into it is because of the coaching that I’ve been doing with Quetz, who’s the Peach player from Perth in Australia. We were just talking about the different, I guess, the fundamentals of the down smash, understanding the 5 hits of the down smash, which hit you actually get. Obviously, if you only get the first hit, then you’ve got to finish the full rotation and the full animation before you can follow up. Whereas, if you get the 5th hit, then you can basically act really quickly out of it. Understanding that, as well as understanding what different follow-ups you can get in terms of recurring dash attacks or chain grabs after you actually get the down smash. The best way that he recommended to practice this was against a level 1 Fox, and so that’s what I’ve been doing. I’ve actually found it really helpful for a number of things. I noticed this when I played at a tournament about a week and a half ago. I had only started practicing this, but something that I noticed is I’ll go and I’ll do a back air to down smash on Fox. But then, the follow-ups just become so much more natural the more you do it. It becomes almost automatic in terms of punishes and things like that. Something that happens with level 1 Fox, obviously, he doesn’t do a lot of DI. But, he almost misses every single tech that you do. Even at downthrow, he missed. That he missed. So, what it’s great for is punishing missed techs. And so, I’m just going to get him off stage and show you. Especially missed techs on the platform. It’s great to recognize the missed tech and then to follow-up the missed tech as well. So you can see that missed tech there. Another missed tech and so you can get these follow-ups. After you down smash, you then basically try and combo Fox to death – is the goal. I don’t know. I found this really useful. I’ve been talking to people about it, not a Twitch chat, but we have a chat group for Peach players in Australia, and a lot of them basically rip on this and say that it’s pointless. Another guy that I’m friends with, he thinks it’s pointless as well, that should just really be practicing against random DI, 20XX, that sort of stuff. But, I don’t know, I’ve got this feeling that – Armada does it. And I do think that when you look at his punishes and when you look at the follow-ups that he gets on a missed tech or something like that, a lot of it can be scripted and can start with stuff that you would get against a level 1 Fox. Obviously, DI is going to be different and so, you need to adjust for that. But, to learn this punishes, to learn the follow-ups that you can hit and can’t hit and things like that just seems to be so useful. And so much fun as well. It’s so much fun just beating up, trying to get the sickest combos that you can. As well, in the meantime, you can practice your missed techs and things like that. Or, you can practice your tech skill, I mean. So, anything that you need to practice while you’re beating up on a Fox, you can do as well. I need to practice wave dash out of shield, so in between it, I can do the double jump lands. I can practice them as well. So you can kind of do tech practice at the same time that you’re beating up this level 1 Fox. And I’m just finding it very valuable and hopefully, it’s going to lead to me having improved gameplay and improved performances in the future and time will tell. So, that’s it for me today, guys. Until next time, keep calm and play Melee. I agree wholeheartedly! Vs lev 1 fox or captain is very fun and has been super useful to me in getting better at peach!